commuterDude: Of small things, big things someday come. That's a shame. I always thought of them as a bicycle-friendly business, and I've always made a point of purchasing something, whether I needed it or not, whenever I've stopped there, often going out of my way to make them part of my route. And I thought their BBQ was great and was saddened when they shut that down. That store is a popular spot for cyclists. You would think that the amount of volume that we bring in every weekend would be more of a positive than a negative. 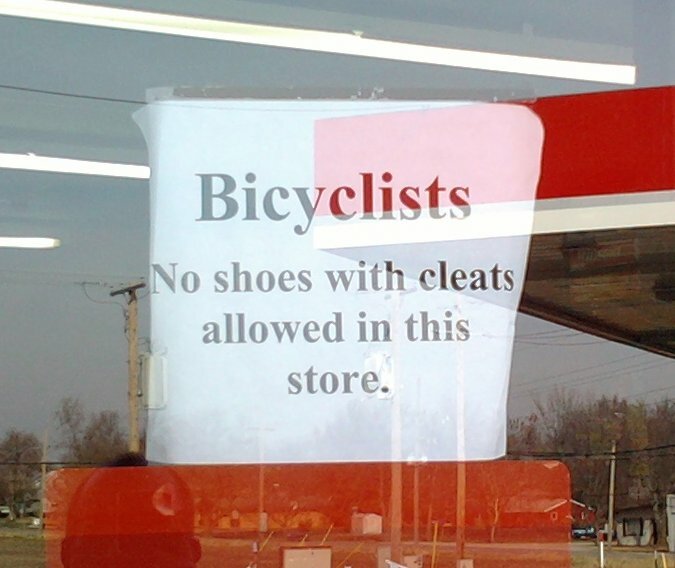 If the sign simply read "No Cleats Allowed" I'd be less offended. I would then expect it to mean that football, baseball, soccer, golf, etc. were also banned. Very well thought out and written. I don't think this is anti-cyclist. I think the opposite. This tells me this store gets a ton of business from cyclist. This business is popular with cyclist for reasons stated above. This store gets me, understands me as a cyclist. The BAK every summer has rules about no cleats inside the buildings that volunteer to host/house/feed hundreds of cyclists. From pictures I have seen signs very much like this one during the BAK and I would not think that ANY of those groups or locations are anti cycling. Enjoyed the post. This is one of the many reasons I stopped wearing cleats a lot time ago. They didn't make me faster, and they did interfere with a lot of off the bike activities I was having. The wording on this sign doesn't exactly roll out the welcome mat for bicyclists but the storeowner is obviously trying to prevent further damage to his floor. A clean shiney floor really makes a place look sweet...like home. However I do get your point. Scarred worn floors send out that rundown, what a dump message and if the owners are living in the store...heaven help them. Well thought out. Thank you. Respect for another's property seems a pretty basic concept. I don't understand the attitude of the first two commentors. Ever had someone borrow your tire irons or frame pump only to throw it on the ground when something about changing the flat didn't go smoothly? Maybe you are the person that borrows something during a ride and then isn't careful or respectful in the way you treat the borrowed equipment. If fellow riders seem reticent to loan use of their equipment ... need this sentence be finished? I know when I refinish our hardwood floors, putting shoes on inside will end. I would like to think you all wouldn't just clog in with them on either. I'm always sensitive when at a guest's house to see if they are wearing shoes or not. If not, I remove my own. It's pretty simple and unfortunately must require a sign. I always feel weird wearing cleats inside the C-stores. This happened 20 yrs ago, at the Woods C-store in Bonner Springs. No Cyclist allowed, because of cyclist not purchasing anything and using it as a free bathroom and water stop. Have not been in it since. Many times we have been at the c-store on 199th and witness the same behavior. I always buy something.